Please see below for a list of the most frequently asked questions & comment by our guests and our replies. We hope they are helpful if you can’t get hold of us. Why won’t the sink in the kitchen empty? 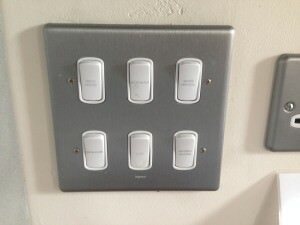 -there is a bank of switches to the left of the hob on the wall in the kitchen (see below). One of these is labelled ‘waste disposal’ If this switch is turned off the sink will not empty. Please switch this on. How do I turn the heating on or off? -Please call us and we will either come and do this for you or give you instructions over the phone. In the picture below there are 3 buttons on the left. 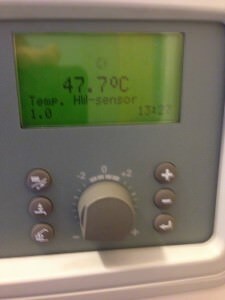 If you press the top one of these the heating setting will appear in the green display at the top. To change the setting repeat pressing this button and the display in the green window will change. ‘Summer’ mode means no central heating, ‘Spring/Autumn’ means low level heating, ‘Winter’ means full heating. How do I turn the heating up or down? -the boiler cupboard is in the hallway. On the front of the boiler is a tear-shaped knob (shown in the centre of the picture above). Turn this to the left to turn the heating down and to the right to turn it up. Can I open the windows wider? -yes you can on some of the windows. If you open the window and look to the left, at the top of the metal arms on the left and right there is the word ‘press’. Please press this on both sides and the window will fully open. This is a safety feature so please be careful if you have small children in the apartment. Not all the windows have this feature. The hob doesn’t appear to be working-help! -the hob is an induction hob. This means it will only work if the pan is actually placed on the ring on hotplate. Once the pan is removed the hotplate automatically switches off. Please place your pan on the hob first. Next switch the hob on using the controls at the bottom and adjust the temperature of the hotplate. -there is but it doesn’t make a loud noise! The apartment has a heat recirculation system. Hot air is extracted from the rooms and used to heat the water in the boiler system. You will see vents in the ceilings of all rooms in the apartment and these are constantly extracting warm air, including in the bathrooms. Please note this system is not an air conditioning system. 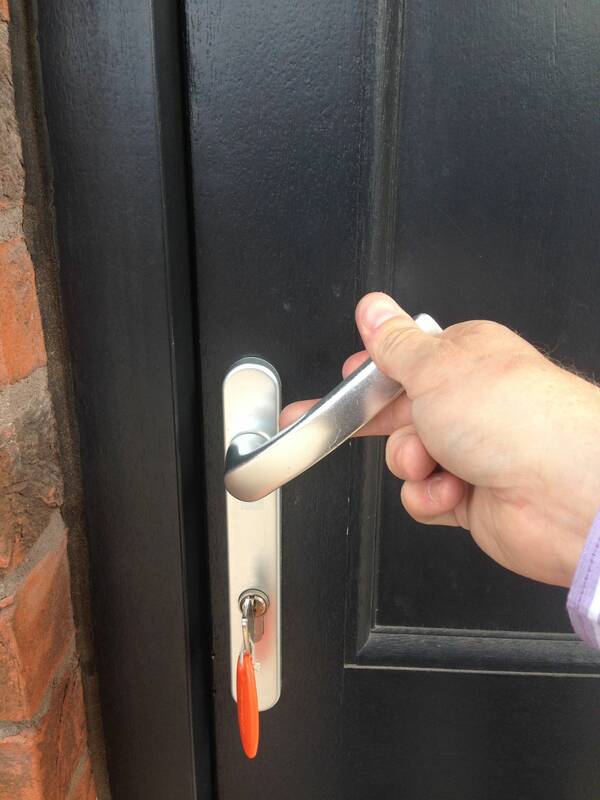 How do I lock the front door? Please push the handle upwards as shown in the photo. Then turn the key in the lock. 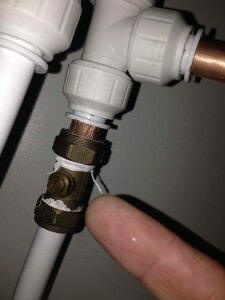 There is a water leak-help! Please call us on 07984 421232. If you can, please turn the isolator switch to the leaking area off. All pipes in UK buildings have an isolator switch as shown in the photo below. This is basically a screw head that needs turning so that the screw head groove is horizontal. This will cut off the water supply past this point. In an emergency you can use a knife to help yo do this. How do we get to the city centre? Please see the map we have provided for you in the apartment. If you walk to the top of Bootham Crescent (i.e. turning left outside the front door of the building), you will be on the street called ‘Clifton Bootham’ in the top left of the map. Follow this street to the city centre. Where are the laundry facilities? The laundry facilities are located at the top of the first flight of stairs at 50 Bootham Crescent. They are free to use. Please leave them in a tidy condition when you have finished. If you are just doing one load of washing please ask and we should be able to provide you with some complementary washing powder. The fire alarm has gone off, what do I do? -if you have not set the alarm off yourself, please leave the building as quickly as possible via the marked exit. -if you have accidentally triggered the alarm by for example burning your toast, please go to the front door of the building. On the reverse of this door are full instructions for resetting the alarm.